Unfortunately here in Tulsa, not everyone wants to get their windows cleaned on a monthly or quarterly basis. Most people just want to get their windows cleaned on a semi-annual or annual basis. I get asked all the time what I use to clean windows. What specifically I get asked what kind of cleaning solution I use. Every company that claims to have some secret formula for a window cleaning solution and it’s just straight up lying. Nearly every window cleaner in America uses either Dawn dish soap, a knock-off brand of dish soap, or a professional window cleaning solution known as glass gleam. There are companies out there that actually make that a marketing point. They will say things like, ” we use especially custom formulated window cleaning solution that keep your windows cleaner longer.” It’s a big fat lie. The kind of soap you use doesn’t really matter so long as it provides Clyde for the squeegee rubber to Glide across the glass. The important part of the window cleaning process is to agitate the dirt and then get it off the glass. Agitation is accomplished by using any kind of sponge or professional window cleaning strip washer to scrub the dirt and was in the debris on the class. The most important part of the process though is not agitating the dirt on the glass, it’s getting that dirt off the glass with the use of a squeegee. The squeegee is what separates professional window cleaners from your average homeowner using Windex and paper towels or newspapers and vinegar. If you’re not getting the dirt off of the glass, logically speaking… The dirt is staying on the glass and you’re just spreading it around with a paper towel. However, here’s some window cleaning tulsa tips to keep your windows clean after we’ve already come through and done the deep and thorough window cleaning tulsa tips. After we have professionally clean your windows with a window cleaning strip washer and Window Cleaning squeegee, and all of the dirt and soil has been removed from the glass, using a paper towel and some spray cleaning solution is much more effective. A paper towel or a normal towel can only pick up so much dirt before it’s no longer effective. At some point, all of that dirt buildup on the towel or paper towel will reach a climax, and then you will just be spreading dirt around the window. It’s important to constantly change out your towels. I would recommend every three to four windows grab a new window cleaning towel to wipe the dirt off the window. The letter that’s on the window to begin with the easier it is to accomplish good results quickly which is why I would only recommend using a paper towel and some store-bought cleaning solution after you have had your windows professionally cleaned. There will be less dirt on the glass and it will be easier for you to maintain clean windows. My favorite store-bought window cleaning tulsa tips cleaning solution is something called glass cleaner by Sprayway. In my opinion it’s far better at cleaning tulsa windows then Windex is. It smells good to me too. After you have hired gleaming glass to clean your windows, head on over to Walmart and buy yourself some glass cleaner by Sprayway. You will be glad you did. Hopefully, you’ll be able to keep your windows cleaner longer before having to have them professionally cleaned again. This episode of window cleaning tulsa tips was brought to you by gleaming glass, Tulsa’s most highly reviewed window cleaning company in Tulsa. Stay tuned for more window cleaning tulsa tips. On second thought, I’m going to give you all a bonus Window Cleaning Tulsa Tips this week. You don’t even have to wait till next week to tune in and get your weekly Window Cleaning Tulsa Tips. I’ve got your Window Cleaning Tulsa Tips right here right now. You may be thinking yourself, I don’t know since he’s giving us a bonus Window Cleaning Tulsa Tips this week, does that mean we are not going to get some Window Cleaning Tulsa Tips next week? Do that I would say no. I mean, I will not be canceling next weeks episode of Window Cleaning Tulsa Tips. The show Will Go On! All right now on to this week’s window cleaning tip. Let’s talk about screen cleaning. I have found that the fastest quickest way to clean window screens is to throw down a square piece of AstroTurf on the concrete and then place the screen on the after Turf so that it’s flat on the AstroTurf. Then use a pressure washer with a 40 degree tip to spray down one side of the screen. Spray off all those bugs spider webs and spiders and all of the dirt 2 off of one side, and then flip it over and clean off the other side. Pick up the screen, and give it a light at three to four taps on the ground knocked off all the water. If there’s any water left on the screen take a towel and wipe it down. If you don’t have a pressure washer I would recommend getting a brush with a lot of bristles like a flocked brush, and scrub down the screen with soap and water. Dawn dish soap is fine. After you’ve completely scrub both sides of the screen, lean the screen up against the flat surface like a wall maybe a brick wall on your home, and use your garden hose to rinse it off. Again, lightly tap the screen on the concrete to knock off the majority of the water. Then use a towel to wipe off any of the remaining water on the screen. You want to make sure all the water has been removed from the screen before you reinstall it on the window so as not to Splash there any water on the clean window if you just clean your windows or have them freshly cleaned by a Tulsa window cleaning company. I would just recommend that you also hire the Tulsa Window Cleaning company to clean the screens as well while they’re cleaning your windows. Hopefully that helps! 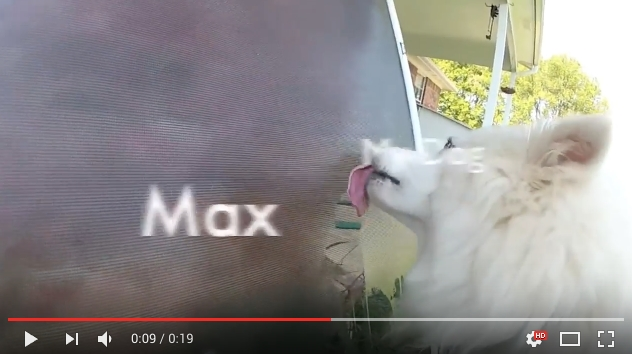 Here’s a picture and video of my dog cleaning screens. If he can clean screens, so can you.